Shoe Mo is a laundry service that offers cleaning, repair, restorations, and custom paint jobs for shoes and sneakers. Founded in June 2017 by Ginny Truc To and Jack Wong, they now have four locations across three cities in Malaysia. Prices begin at RM30 for basic cleaning services. Ever since Converse introduced the All Star back in 1917, sneakers were destined to be a “thing”. Over the past hundred years, the sneaker has become a staple part of everyday fashion, with companies such as Nike, Puma, and Adidas building entire business empires off their popularity. So widespread has the love for sneakers become that its global market is expected to be worth US$220.2 billion by the year 2020. With such huge demand for a product comes opportunity for business, in this case, sneaker cleaning and customisation. 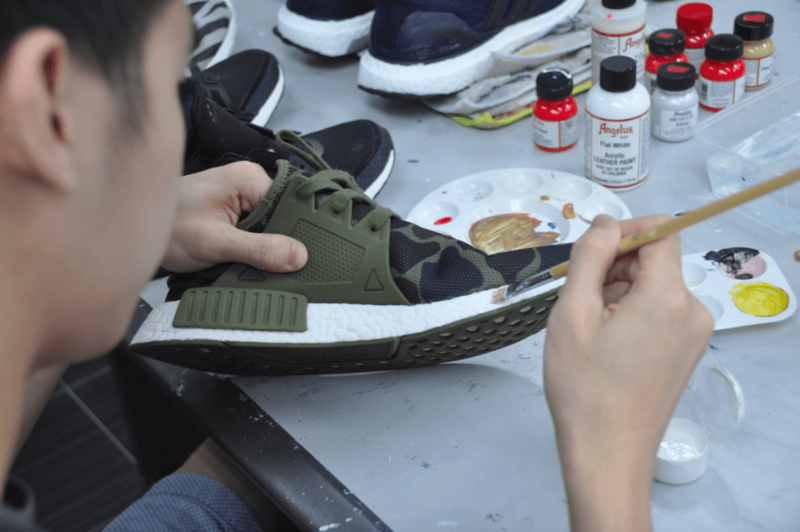 Officially launched in June 2017 by Ginny Truc To—a Vietnamese local who relocated to Kuala Lumpur—and Jack Wong—a former army man—Shoe Mo provides cleaning, restoration, and customisation services for shoes and sneakers. According to Jack, it all began when he and Ginny, both 29, were out jogging together two years ago. Currently, Shoe Mo (which is meant as a shortened form of “Shoe Maestro”) operates five outlets across Malaysia and provides customers footwear care services such as midsole repainting, water repellent coating, and custom decaling to give sneakers a personal touch. They’ve also made their services affordable, with basic cleaning services starting at RM30. “We carried out the services by ourselves in the beginning,” said Ginny, detailing how she and Jack would rush home after work hours to clean shoes, experiment with techniques, and brainstorm for new ideas. According to the both of them, the main target that Shoe Mo has set for itself is to become the standard go-to for shoe and sneaker care in Malaysia. And in that endeavour, Jack and Ginny are actively searching for ways to rapidly scale and acquire market share. Building on this realisation, they figured out that the best solution to this problem was to systematise their operations and thus customised an internal system to help them with this cause. It’s this very system that may give them the competitive advantage they need. But even though the both of them are eager to grow the Shoe Mo brand, they are also warm to the idea of more players entering the scene. “But we still see this as an advantage because the more marketing effort we make as a whole, the more we unlock the market and raise the awareness of this type of service. Jack was equally as enthusiastic about the collective growth of their market and stated his keenness to see how the big players would end up helping the smaller businesses like themselves. There are obstacles that the both of them are currently facing, however. To solve this, Shoe Mo is enhancing team communication and empowering their team members to step up and take management roles. After under a year of being operational, Shoe Mo has serviced more than 5,200 pairs of shoes with around 23% of the clientele being repeat customers. And looking forward, Shoe Mo is aiming to grow while simultaneously improving the quality of its products and services.